Fishes are vibrant creatures living in the seas, oceans and lakes. These exotic marine animals usually thrive in warm tropical climates. A sense of mystery revolves around fishes, as most of the oceans of the world are still unexplored. Fishes come in various shapes, colors and sizes, and are associated with certain religious faiths and traditions. The unusual bodily structures inspire awe and wonder in kids. Fishes coloring sheets are very popular with kids, who take immense pleasure drawing and painting these aquatic creatures. 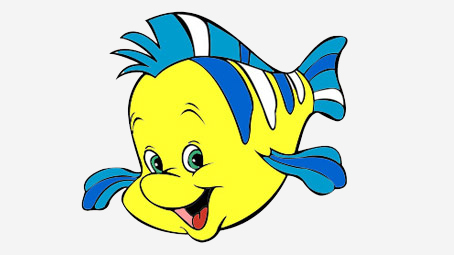 The article presents you a wide collection of fish coloring pages printable to enhance your child’s artistic skills. 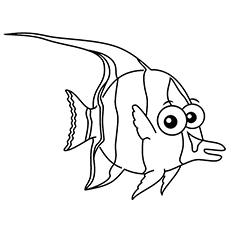 Teach about the different breeds of fish and their unique characteristic with these fish coloring pages free to print. This happy whale will appeal to any child who loves the ocean. 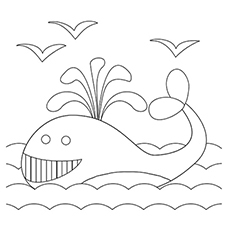 Your child can spruce up this scene by coloring this whale anyway he wants. While coloring, tell him some fun facts about whales. The blue whale is known as the largest animal to have ever existed. The humpback whales can live for up to 77 years, while some bowhead whales can live for over a century. These intelligent, aquatic creatures breathe air through the blow-hole. They have sleek bodies that allow them to move easily through the water. Dolphins are extremely popular with kids. 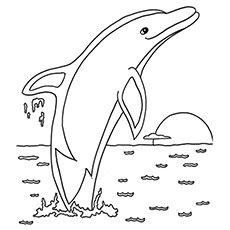 This coloring sheet features a happy dolphin taking a giant leap across the waves. Dolphins are cetacean mammals related to porpoises and whales. They are found worldwide in shallow seas and oceans. These playful animals are known to surf, spin and do the acrobatics. They are extremely friendly and are known to save the lives of other species including humans. 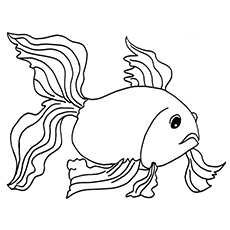 Find your child’s inner zen with this Koi fish coloring sheet. Ask your child to add some bright and beautiful colors to help build his fine motor skills. Koi fish is a group of ornamental fishes kept for decorative purposes in outdoor ponds and water gardens. They are found in several colors like white, black, blue, cream, red and yellow. They are also depicted in artworks and tattoos. Is your child thinking of adding an angelfish to the tank? 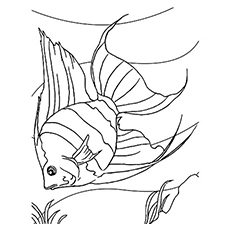 Then hand him this beautiful angelfish-coloring sheet to him. Make sure they color the bubbles and background in this image. This is one of the most common aquarium fishes. They add a lot of grace and dignity to the tank. Angelfish is a freshwater fish belonging to the Cichlid family. They are native to South America. Here you can see a catfish, a type of ray-finned fish. It is named for its prominent barbells, which resemble a cat’s whiskers. They have flattened broad heads and an elongated body. Catfish also makes a wonderful addition to a large community aquarium. They are excellent scavengers and help maintain the water quality. These bottom-feeding fishes are found in freshwater habitats and coastal region in every continent in the world. This coloring sheet is perfect for kids who prefer slimy and scaly fishes. 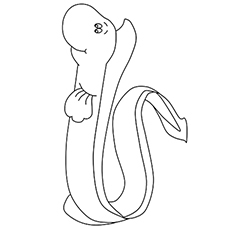 The diagram features eel, one of the most commonly found fishes in the world. Eel is an order of fish, which consists of 4 suborders and 20 families. This elongated fish range in length from 5 cm to 4 meters. They are usually found in the shallow waters of the ocean and burrow into mud or sand. Some species of eel are also found in deep water or continental shelves. 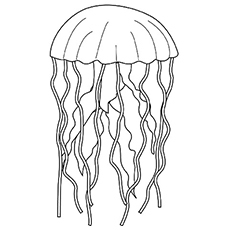 Have your preschooler practice his coloring skills with this jellyfish coloring sheet. Did you know that jellyfish have inhabited the sea for at least 500 years? Share these and some more facts about jellyfish with your kids to increase their general knowledge. Jellyfish is a free-swimming marine animals belonging to the phylum Cnidaria family. They have a gelatinous, umbrella shaped body and trailing tentacles. Large and colorful jellyfishes are common in coastal zones around the world. They have stinging, poisonous tentacles that are used for capturing the prey. What do you think this shark is grinning for? Let your child decide that as he colors the sheet. Sharks are considered the deadliest fish. Some of the common species of sharks include tiger shark, great white shark, Mako shark and the hammerhead shark. A great white shark can be as big as 20 feet long and can weigh more than 5,000 lbs. 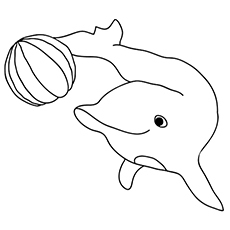 Here is a coloring sheet of porpoise, a small cetacean belonging to the Phocoenidae family. They are related to whales and dolphins. Porpoises are smaller and stouter than dolphins. They have shorter beaks, flat, spade shaped teeth and a slim body. They are usually found across the Northern Hemisphere. 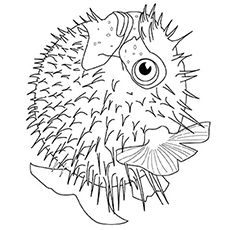 Have an undersea adventure with your child with this puffer fish-coloring sheet. 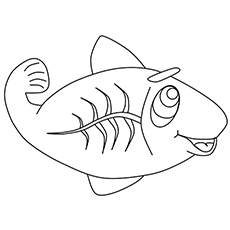 Your kid can color this unusual fish in white or gray or make it look colorful by adding some bright colors to it. A puffer fish is also called porcupine fish because of its large, external spines. It is believed to be the second most poisonous vertebrate in the world. Puffer fish is mostly found in the tropics. 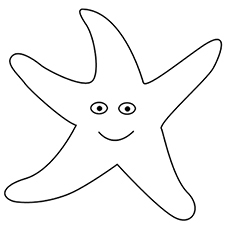 The coloring page here features a fascinating starfish. With a few crayons, your child can transform this black and white starfish into a beautiful creature. Starfish is a star-shaped echinoderms belonging to the class of Asteroida. These marine vertebrates have a central disc and five arms. Some are also known to have more than five arms. They are found from the intertidal zone down to the abyssal depths. This beautiful fish comes in several bright colors like red, orange, blue and brown. A cute goldfish, is seen in this picture, swimming through the water. Ask your child to make a beautiful background to display his creative side. Goldfish belongs to the Cyrinidae family. It is one of the earliest fishes to be domesticated. The fish is native to East Asia. Goldfish is the most popular aquarium fish. They vary greatly in body size, shape, coloration and fin configuration. 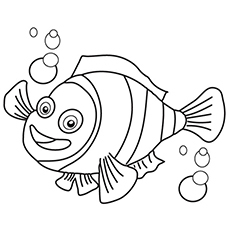 Have your child color this simple image of a clown fish in orange and white while teaching some fun facts about this underwater animal. This picture is ideal for young learners. It will make a great addition to the ocean lover’s collection. Clown fish, also known as anemone fish, is native to the warmer waters of the Indian and Pacific ocean. It usually lives in the sheltered reefs or in shallow lagoons. They are found in a variety of colors like red, yellow, orange and even black with white bars or patches. After your child finishes coloring you both can enjoy watching Finding Nemo movie, where the protagonist is a clownfish. Give your child a fish eye view of the ocean world with this fun coloring sheet. 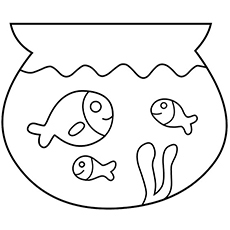 The diagram shows a bowl full of fishes. Your child will surely enjoy practicing his important co-ordination skills while coloring the sheet. The coloring sheet has a very simple outline, making it ideal for the young learners. Ask your child to review the different shapes he sees in the picture. Also, encourage them to use their imagination to draw in some details in the sheet. Give your child some happy time with this sheet featuring a Moorish idol. A Moorish idol is a beautiful fish that is believed to bring happiness. It is a small marine fish and the sole extant representative of the Zanclidae family. It is a common inhabitant of tropical and sub-tropical reefs and lagoons. The fish has a compressed, disk like body with contrasting vertical stripes in black, white and yellow. Moorish idols are often kept as aquarium fish for their divine beauty. 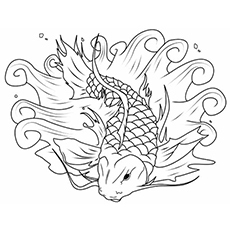 The coloring sheet features a beautiful fish with long tail and fins. 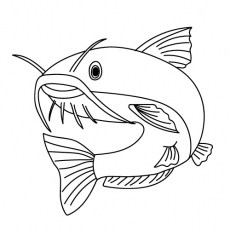 Your kid will have a blast coloring this striped fish. Tell your child to choose some vibrant colors to make this fish come alive. The page, when colored, will create a beautiful masterpiece to hang on the fridge. It is also a great way to introduce about sea life to your child. This under the sea coloring sheet is sure to be a hit with your preschooler. The coloring sheet features a bunch of fishes swimming in the sea. The tricky spaces in the image will help strengthen the writing muscles in a fun and creative way. What color will look best of them? Let your child decide that as he brightens up this scene. 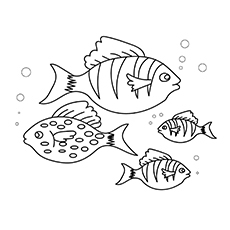 Make this coloring time a fun session by asking your child to name the fishes that he sees in the coloring sheet. This fish looks a bit dull without any color. Could your child help him look beautiful by adding some color in it? Ask your child to paint the fish according to the colors assigned. The page will help your child practice color mixing and number recognition. 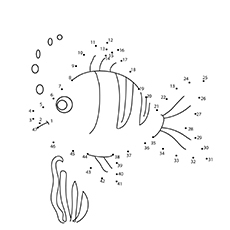 Help your child practice number with this fun dot-to-dot coloring sheet. Ask your child to connect the dots from 1 to 41 to complete the picture. When he has connected the numbers, ask him color the fish and the ocean surrounding. Miss Fish is going for a relaxing swim near the ocean floor. Your child can make this fish fancier by giving it some color. As he works on this sheet, he will get a lot of practice coloring inside the lines. 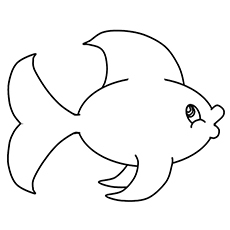 Encourage your child to color this fancy fish any way he likes. He can also color each motif in a different color. 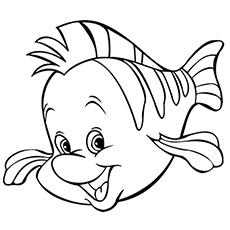 Here is a coloring sheet of Flounder, Ariel’s best friend and companion. This cute coloring sheet is sure to make anybody smile. This sheet is guaranteed to impress your fairy-tale lovers. Let your child’s imagination go wild as he colors this beautiful fish. Have you heard of the X-ray fish? It is a fish with a translucent body. The transparent skin makes it difficult for the predators to spot them. This fish is found widely in the Amazon and Orinoco basin. The bony structure contributes to their acute sense of hearing. This fish usually lives in large groups. The male X ray fishes are smaller and thinner than the females. This mermaid is happily hanging out with her fish friends at the bottom of the sea. You can make her happier by asking your child to color this sheet. 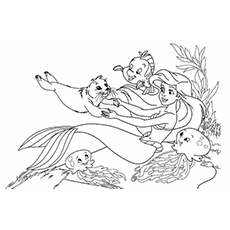 With lots of little fish around this mermaid, your child can fill this page with different colors. He will get some counting practice too. After your child is done coloring the sheet, tape it on the wall. 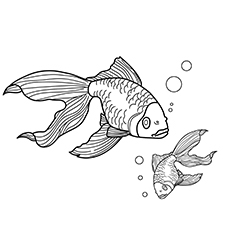 Introduce your child to the world of alphabets with this “F for fish” coloring sheet. 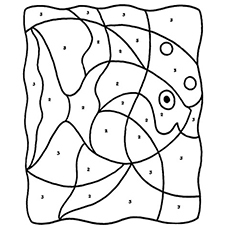 It will have your child coloring this adorable fish while learning the shape and sound of the letter F.
Try to focus on teaching the letter first and then help him understand the words. 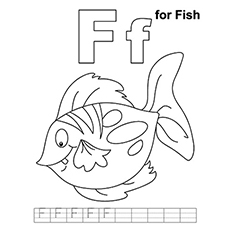 Ask your child to trace the letter F and then color the fish in the brightest shades possible. 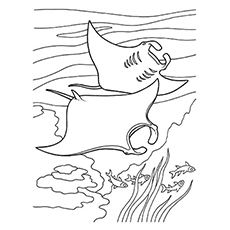 Here is an exciting Manta Ray coloring sheet for your child to color. Manta ray is a large eagle ray belonging to the Manta genus. It is found in the temperate, tropical and subtropical waters along the continental shelves where food is in abundance. This large fish swims across the ocean by moving its pectoral fins up and down. Its short tail allows it to be more acrobatic. Your child will surely enjoy learning the fascinating facts of the fishes with these fish coloring sheets. It will also make a great addition to ocean and school sea project. You can also prepare your own fish coloring book. 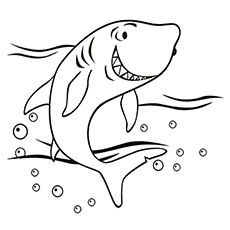 These free printable fish coloring pages online will improve your child’s motor skills and will help them with color recognition. It will also stimulate the imagination of young kids. Hope you like the article. Do share your thoughts in the section below.